Summary: Looks, money, power, scandal and tragedy – JFK had it all. Author Hamilton recounts JFK’s life from birth (1917) up through his election to congress in 1946. 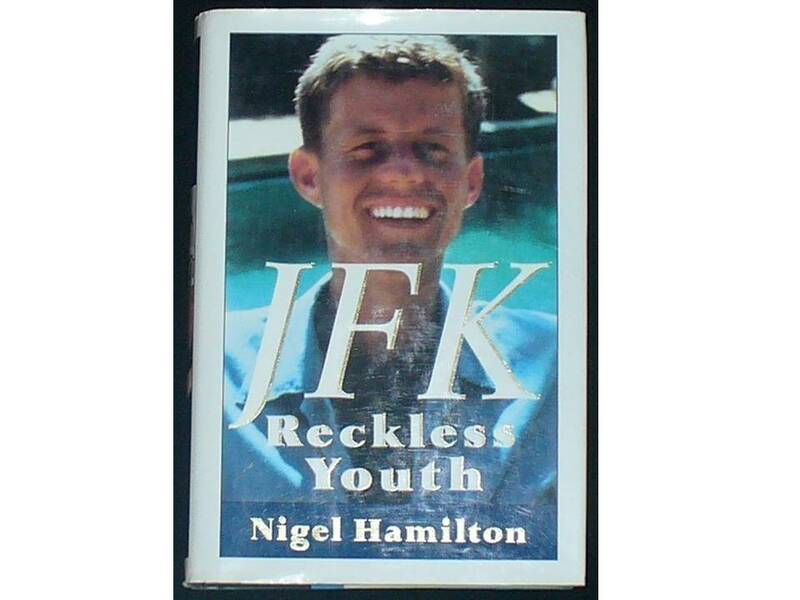 Reckless Youth is a terrific, readable account; it’s a shame that Hamilton never published the other volumes in what was supposed to be a series on Kennedy’s life. Review: Sometimes it’s hard to remember that John F. Kennedy was president for less than 3 years, given America’s Kennedy obsession. Author Nigel Hamilton set out to write a multi-book biography of JFK, but finished just the first volume. That work – Restless Youth – is a terrific look at JFK’s early years. The key to understanding JFK – as with so many people – lies with his parents, Joe and Rose Kennedy. Hamilton detests both of them. Rose found herself stuck in a marriage to a wealthy philanderer; she dealt with it by all but abandoning her children. Instead, she spent her life traveling and shopping. Eventually, JFK came to despise his mother. At the very least, Joe cared about his children, though in a twisted, controlling way. Joe regularly hired private detectives to check up on his kids and their friends; he also discouraged the kids from going in to business to prevent them from having financial assets of their own. Joe and Rose sent the kids to boarding school at the first possible moment. Some of the kids were as young as eight years old. Though the family had a huge house in Bronxville, New York, the kids were almost never there. In fact, they had no rooms of their own. When they came to visit, they had to ask which bedroom the would be using. The home was, therefore, more like a hotel. Though Hamilton dislikes Joe and Rose, he sees JFK as a remarkable person. Hamilton uses JFK’s schoolboy letters (often written to his best friend, Lem Billings) to trace his development. One especially good section concerns a summer 1937 trip that JFK and Billings took to Europe. Seeing Europe on the brink of war had a huge impact on JFK’s thinking. The account is vivid and the reader wishes that he or she could have gone along for the ride. Hamilton does a good job of describing JFK’s magnetic personality. One World War II buddy says that the chronically-sick JFK said that “…he’d never had an unhappy day in his life” (p. 629). Though shy, Kennedy clearly had a way of attracting people and of retaining their friendship. Though the story of Kennedy’s service in the U.S. Navy is well known, Hamilton does it justice. At a meeting in Chicago to recruit PT captains, Kennedy and other potential enrollees were told “Those of you who want to come back after the war and raise families need not apply; PT boat skippers are not coming back!” (p. 505). Hamilton makes clear that the sickly JFK could easily have skipped military service altogether, but chose not only to serve, but to volunteer for the PTs. Regrettably, Kennedy could not escape Joe and Rose without some psychological wounds. Playing amateur psychologist, Hamilton views Rose’s early rejection as the stimulus that spurred JFK’s infamous womanizing – “…he buried his fractured psyche in a lifetime of fruitless womanizing, of continual, purgative, sexual conquest that would relieve his libido yet never bring him contentment” (p. 113). The shifts in tone in Reckless Youth can be jarring to the reader. Hamilton discusses many “highbrow” topics: Joe’s diplomatic career, JFK’s mental development, JFK’s many illnesses, etc. However, the book may quickly turn to “lowbrow” issues, which heavily focus on Joe & JFK’s affairs (including explicit details of Jack’s many bouts with venereal disease). Reckless Youth ends with Jack’s 1946 election to the House of Representatives. Hamilton “baits the hook” for the (unpublished) second volume in his series by mentioning several changes that were underway in JFK’s life. First, Joe “ran off” many of Jack’s friends and – instead – surrounded his son with lackeys. Second, JFK also began to take many of his friends for granted. Another tantalizing idea that Hamilton drops is that JFK’s obsession with thwarting the totalitarian Soviets was related to his own feelings of being run over by his father. Once again, the reader wishes that Hamilton had finished the series. Though I enjoyed Reckless Youth, there are areas for improvement. First, the book can drag in places, as in Hamilton’s account of Joe’s diplomatic career. Also, Hamilton quotes too many letters in their entirety, when quoting selected passages would save the reader time and effort. Second, Hamilton tends to interject opinion a bit too freely instead of letting readers decide for themselves. For instance, after quoting a teacher who didn’t like JFK, Hamilton writes of the man (who was a closeted gay) – “Maher was writing like a nagging old woman – an old queen in more ways that one” (p. 134). More objectionable, Hamilton quotes an anonymous source who “…speculated as to whether [Joe]… might have sexually abused [JFK’s retarded sister] Rosemary…” (p. 411). This sort of material cheapens the book and it’s certainly not needed to make the point that Joe was a scoundrel. The best thing that one can say about Reckless Youth is that – even at 800 pages – it’s a book that you want to read. JFK had a fascinating – if short – life and Hamilton does an excellent job of covering its first 29 years. This entry was posted in Books, Articles, & the Arts, Semi-Informed Reviews & Opinions and tagged 1960s, American politics, American presidents, book reviews, Bronxville New York, diplomats, Joe Kennedy Sr., John F. Kennedy, Kennedy family, Lem Billings, Nigel Hamilton, PT Boats, Reckless Youth, Rose Kennedy, Rosemary Kennedy, Soviet Union, World War II. Bookmark the permalink.